Despite a rather high degree of specificity, Disdainful Stroke is and always has been a good card. Even against decks with a wide range of mana costs, it handles the section of the curve that is often the most dangerous. While the likes of Mana Leak and Spell Pierce are good in larger formats because they are strong in the early turns, Disdainful Stroke becomes a better and stronger answer as the game goes on, which gives it a role even in those formats whenever you need to play (or fight against!) a slower deck. And apart from all of that, in any given Standard it’s most likely the cheapest counterspell that can target any kind of spell. Disdainful Stroke has been a solid bit player for a while now, thanks to its flexible mana cost and ability to screw over plays in the late game. While there are decks that Disdainful Stroke is almost completely dead to (anything low and to the ground, like mono-red aggressive decks), there’s usually going to be at least one target to Stroke away. This fares better as average mana costs go higher, and there are enough things it misses to not make this an all-time great, but four mana oft is the “soft” starting point for the major threats, so being able to get rid of one before it even hits the board is a good place to start. 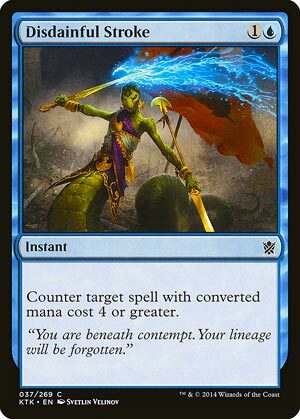 Aggressive blue decks and control decks may have use for a couple copies as part of a countermagic package.